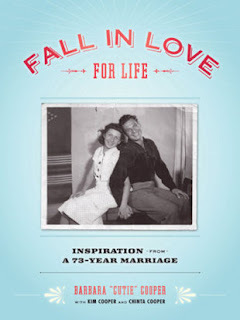 After 73 years of marriage, 94-year old Barbara Cooper knows how to get through matrimony's rough patches. The author of Fall in Love for Life shares her hard-earned wisdom. "I don't understand couples who say they are too busy or too tired to sleep together. Unless they are building roads all day or running a multi-national corporation, I expect they have just lost sight of priorities. If you wish to stay connected and happy in your marriage, my advice to you is to never be too tired or too busy to feel love for your partner. When your life is nearly over, you will regret it if you look back and recall too many nights when you made excuses instead of making love." "The most important thing for any couple trying to get along is to think before you speak. If you are bickering and find that you are getting angry, take a deep breath and change course, and ask your partner to do the same. Try saying something conciliatory like, 'I don't know why this is making me so upset, but it is, so can you just humor me and help me get over it?' By simply admitting you are losing your cool, you may find that the anger quickly dissipates." "If you want your relationship to survive and to thrive, you will have to train yourself to focus most of your attention on the person you love. When your sweetheart comes into the room, whether it's just from taking care of some chores in the garage or from a long day at work, your job is to put down whatever you're doing, look him in the eye, and verbally express your delight at seeing him again. It's really so little to ask, and delivers so much - to both of you." "Some people have affairs because they tell themselves that they deserve more attention than they get at home. Or maybe they get annoyed because they feel that all of their needs aren't getting met by their partner. Well, whoever told them that one person could meet their every need? You can actually live quite comfortably without having all of your needs met. Try thinking about it that way; you might be surprised how liberating it is. You are not perfect, and neither is your partner, but you can make a very pleasant life together if you are both serious about providing the love and support that go along with a marriage." "It's true that when your babies are small, there isn't much time left over for romantic gestures. But the wonderful thing about romance is that it is the quality, never the quantity, that matters. So when the baby is napping, throw a blanket on the living room floor, slice some peaches or plums or whatever you have in the house, pour a glass of something bubbly, and enjoy a mini picnic. Write love notes to each other and slip them in between the clean diapers. Be creative, and if you want your love to flourish, it certainly will do so." "The most important ingredient for getting through tough economic times is THE TRUTH - it's so important it should be capitalized and italicized. So this means that if you have any financial secrets you are keeping from your partner, you must put them on the table. Doesn't that sound scary? I am sure it does, but as with so many unpleasant things that only get bigger and stronger in the dark, these secrets have a funny way of shrinking in the light of the truth. And as they get smaller, your stress and worry will fly away. There's never a better time to be honest with your partner and yourself and make a plan for dealing with your debts and your excess spending - together. I promise, you will not regret it." "I think the place where good marriages break down is when one or both parties begin to take the other person for granted. And yet it's understandable that this happens. Life is complicated and can be exhausting, so there is always a temptation when you get home to just tune out, because home is one place where you should feel safe enough to let your guard down this way. But there's a difference between relaxing and disengaging, and while relaxing is a healthy way to recharge your psychic and spiritual batteries, disengaging is a drain on you and your relationships. Nothing is more important than that you recognize the difference and stay present for all the people you love." "The most important lesson I can teach you from our happy marriage is that we did not rehash. If something was unpleasant, we got through it, handled the fallout, and did not bring it up again in happy times. So we both knew that once a problem was solved, that was it - we would not have to answer for it again, at least not in its current form. And knowing this, we could give all our attention to fixing the problems that came along, because once they were fixed, we could forget about them, which is a very wonderful feeling." "Have you ever noticed that you can't spell dangerous without anger? I'm no linguist, but I don't think that's a coincidence. When you're ready to blow, you might say anything hurtful, things you would normally spare the person you love from hearing. Don't say something you'll regret forever. Don't give your partner an excuse to come back to you with his or her own resentments. Instead, find a way to get your anger under control. For myself, I simply run through my mind a short movie of how foolishly I have been acting. You may have better luck singing a silly song, or patting your head while rubbing your tummy, or doing whatever little trick helps bring you outside of yourself long enough to regain control."